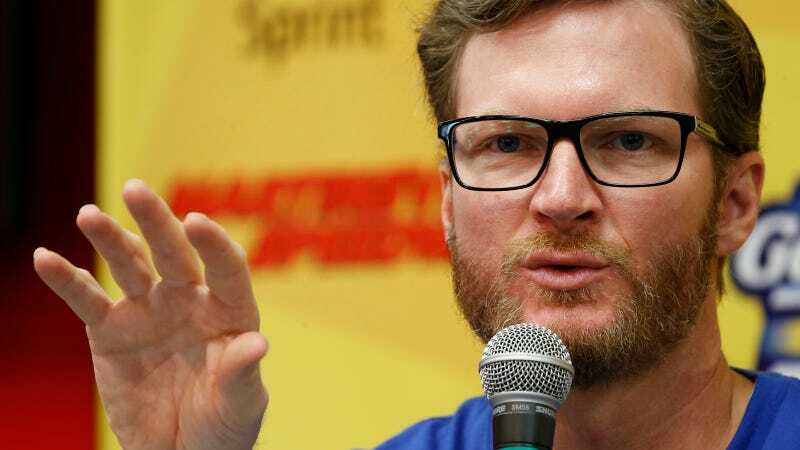 Despite only just announcing his retirement from NASCAR at the end of the current season, Dale Earnhardt Jr. is already planning to substitute racing’s adrenaline withdrawals with plans for a new home renovation program on DIY Network next year. That’s right! After thrilling millions of racing enthusiasts in the high stakes, high stress NASCAR racing environment for 18 full seasons, Earnhardt Jr. is teaming up with his wife to thrill millions of waiting-room occupants with the high stakes, high stress world of do-it-yourself home renovation, according to USA Today. So far there’s not any more details on the show, but it’s set to air next year. Home renovating is a lot like NASCAR, probably. Team work. Expensive stuff. Oh! Garages. Good luck Dale. Keep in mind you’re still at high risk for head injuries, so helmet up. We’re totally going to take your new show super serious when it airs. Maybe have us on the show to help out! We’ve had quite a few projects at various stages of completion over the years.